Xander is 10 years old. Xander has been Faith’s “brother” since we brought him home. He and Faith were born a year apart. Initially, Faith didn’t really care too much for Xander. He was an intrusion into the household and to her lifestyle. She was used to being the only “child” and now she had to share attention with this other canine. Xander’s manly charms eventually won her over and they became best buddies. Even though Xander was the man of the house, Faith was the boss. Xander may have had the louder bark, but Faith was the dog that always set things in motion. Xander wouldn’t think to bark unless Faith allowed him to do so. It was Faith that did the commanding in the household; not only did she command Xander but the rest of us as well. If Faith did not get her way she would refuse to “speak” or look at any of us. Faith was the only animal I had ever encountered that could not be bribed by food. No amount of her favorite food could coax her into becoming your friend again once she was ticked off. If she were particularly mad, she would walk close enough to you to make you think you might be able to touch her only to dart away quickly leaving you looking rather foolish for even trying to pet her. As Faith grew weaker over the years, Xander took up his pseudo role as boss dog. The role seemed to be reversing and any stranger entering the house might have thought Xander was the dominant dog but if that same stranger stayed just a little while in our home they soon learned that Faith was still in command. The smallest dog in the household was the largest life force. 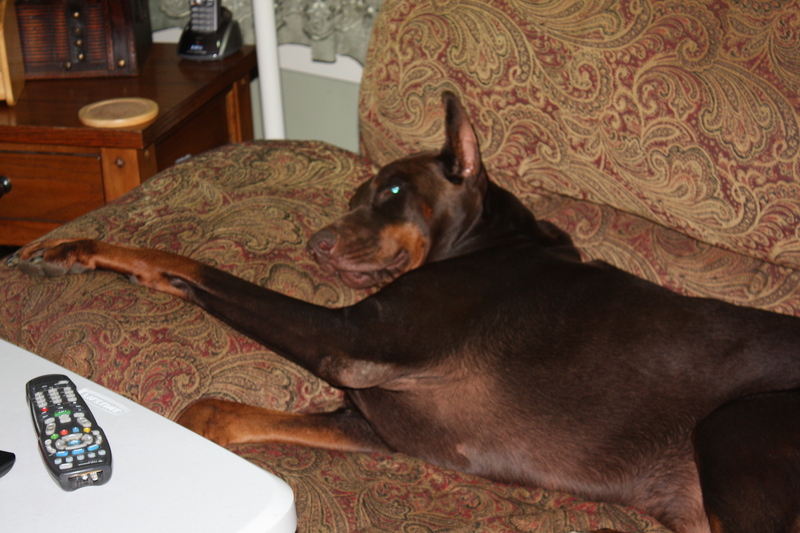 Faith was the queen and all bowed down before her; even our Doberman when he finally became a part of the family. The only time Xander didn’t listen to Faith was grooming day. Faith didn’t really care for the groomers but Xander loved to get bathed, brushed and smelling good. Xander thought he was so handsome on grooming day often strutting back and forth in front of the mirror to look at himself. Faith, on the other hand, would rub her body against anything she could to get that nasty grooming smell of of her but before she could do that she had to escape Xander. The groomer use to say she could put both dogs in one cage before grooming but she had to separate them afterwards because Xander would not leave Faith alone. Once home from the groomers the torment was one. Xander would chase Faith around the house just to …. well, you know…and Faith wanted no part of that. She’d eventually have to hide under a dresser where he was just a little too big to follow her. The scene in my mind still makes me smile. The bond between siblings is strong; even if those siblings are canine. Xander now sits at one door or another waiting vigilantly for Faith to return. He sits by the either door most of the day and night. He sits, he doesn’t lay, and he cries. He cries softly but he still cries. Sometimes, I catch my father and Xander crying together. Xander doesn’t know that his and my father’s beloved Faith is buried just beneath my father’s window, very close to the place she used slept under my father’s desk. She is so close. Her presence fills each and every room. I can almost reach out and pet her….almost. Categories: Family, Life Lessons | Tags: Death, Dogs, Fathers, Parents, Siblings | Permalink. It was the year 2000; the dawning of a new century, when my mother died in May. It wasn’t a good time for any of us as we watched our matriarch take her last breath and our patriarch fall into a deep depression at our mother’s death. It seemed that only gloom and doom was on the horizon. In the year following my mother’s death, my family and I moved in with my father and the push was on to bring a puppy into the family. My father didn’t want any part of a dog so resistance was high; but the push and tug of my youngest daughter at her grandfather’s heart string brought a new puppy to home. 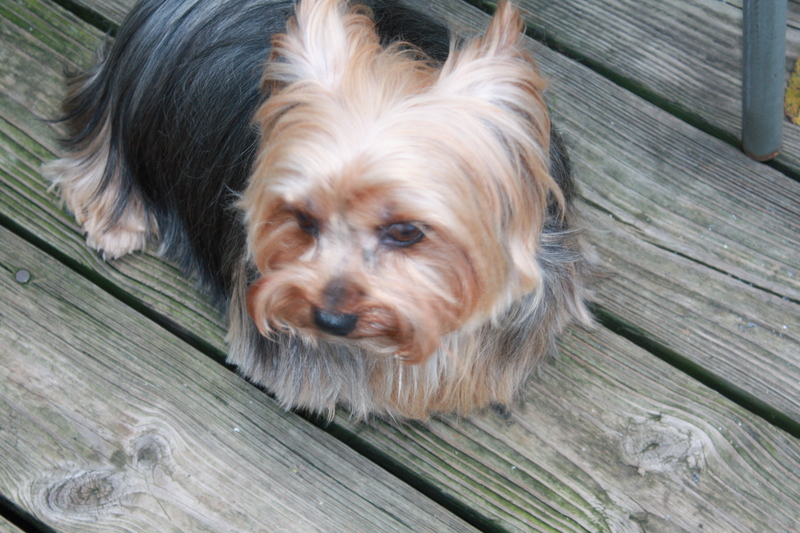 Faith was born in 2001 to a 2 1/2 pound father and a 5 pound mother; both blue-blooded Yorkshire Terriers. It didn’t really matter to us that Faith was born of royalty. She was our puppy and we loved her at first site. 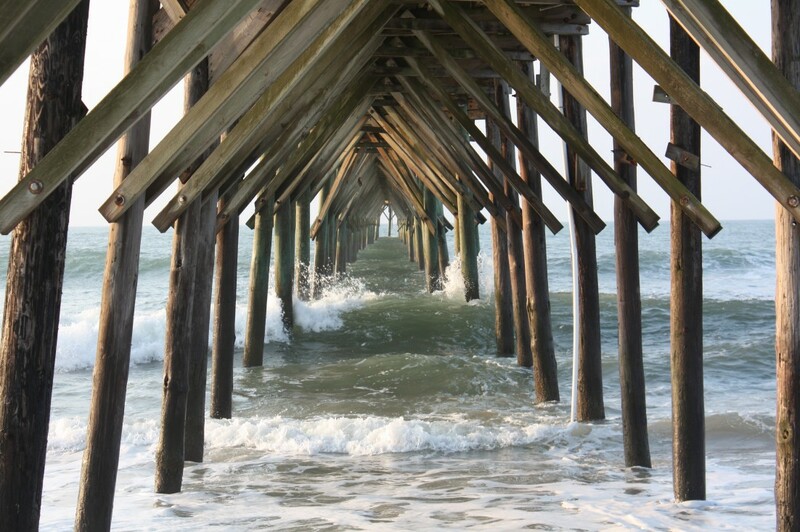 As Faith began to grow, my father’s depression lessened. Faith had picked my father to be her “owner.” She was his constant companion often times punishing him if he was gone too long or didn’t say hello to her first. She had a cocky attitude and he loved it. In my humble opinion, Faith was the sole reason my father came out of his depression and started to enjoy life. My father cherished Faith. She was his girl. In fact, he called her “big girl” more than he called her Faith even though she was so tiny. 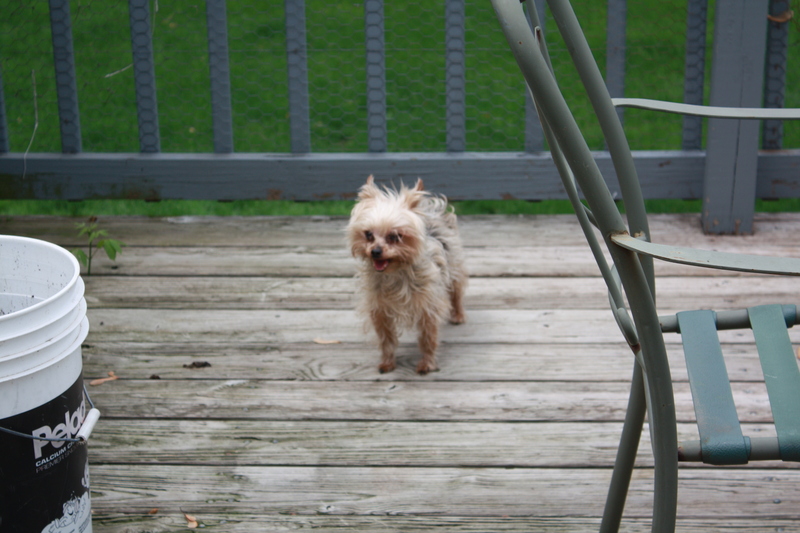 When Faith was three years old, she was out on our deck sunning herself as she liked to do. She jumped up suddenly into my father’s arms and started to rub her head against his chest. My father, sensing something was wrong called for me immediately. It wasn’t but a few minutes later that Faith was in complete anaphylatic shock. I scooped her up in my arms and raced to the vet’s office making it there in less than 9 minutes. The vet cleared the office and took care of her; essentially bringing her back to life. Faith had escaped death. Faith was a spitfire. She didn’t like visitors and didn’t want anyone near my father. Her little 5 pound body would attack anyone who entered his domain. Slowly, the spitfire began to fizzle out and she started to lose weight. She dropped down to 3 pounds but was still my father’s constant companion. I took her to specialist after specialist and started her on all sorts of treatments but eventually I made the decision to stop those treatments that were painful to her and let her live a happy life. She dropped to 2 1/2 pounds and then stabilized. When I say stabilized I mean that she didn’t lose any more weight but she never gained any either. If you picked her up to cuddle her every bone in her body could be felt. She still followed my father everywhere. Her head would always be craned upward to look at him so adoringly. I often commented that the look she gave my father was one of complete love and devotion; a look only a hero is worthy to receive. Faith ultimately took up residence under my father’s desk in his room. She would bark at him when it was time to eat and she would bark at him when it was time to go to bed. My father would put Faith to bed and then wait until she was asleep to sneak back out of his room. My father was completely devoted to his sweet companion. In my father’s eyes, nothing was too good for Faith. He fed her from his plate before he ate to make sure she got enough; dog food was way beneath her and my father catered to her every whim. Recently, my family has been talking about taking a trip to see my father’s family in Puerto Rico. I told my father I would not go without him. He told me he would not leave Faith at a kennel because she is too fragile and he would just rather stay at home with her. I agreed with him that Faith couldn’t go to a kennel because the vet had quit giving her her immunizations because of her weakened condition so kennels wouldn’t accept her so I told him that I could probably find someone to watch her. He didn’t like the idea but when I told him my friend (who knows exactly how he feels about Faith) would watch her he said he’d entertain the idea. Today, while my father was home alone with the dogs, Faith made, what my father said, was an odd sound and then quit moving. He called my daughter and told her that he thought Faith was dead. My daughter called me and I rushed home to see what was happening. Faith had not died, but she was in the processes of doing so. As I did after the bee sting, I scooped her up and rushed to the vet’s office; but this time my vet was closed and I had to hurry to another office. They whisked Faith out of my arms only to return a few minutes later telling me she had “passed out.” I saw how she was breathing. I saw that she couldn’t lift her head or stand on her own feet. She did not “pass out” she was actively dying. They left Faith with me and I held her close. My father left the exam room. He couldn’t stay. Faith and I were alone. I sang to her. I told her I loved her. I thanked her for sharing her life with us and I thanked her for loving my father and bringing him out of his deep depression. The vet, whom I had not seen before, came into the room and told me it was time for me to stop crying and do what was right. He told me that it was time. He said Faith was suffering and it wasn’t about me it was about the dog. I wanted to punch him in the throat but he was right. As much as I didn’t like his attitude, the situation was about Faith. I understood that more than he did. I told him I would not let her suffer. I had promised Faith long ago that I would not let her suffer and I wasn’t about to go back on my promise to her now. Her breathing was so labored and she couldn’t even hold her head up to look at me; I had to hold her head in my direction. “Are you going to stay with her when we do this or are you going to leave?” the vet questioned. He attempted several times to get the needle into her vein without success until he finally just delivered the deadly drug to her under her skin and told me it would take a little longer than the IV route. I held her. I sang to her. I told her I loved her over and over again until she was gone. My Faith is dead; but her memory will last a lifetime. I love you Faith. Categories: Life Lessons | Tags: Companions, Death, Dogs, Love | Permalink. You Treat Me Like a Dog! I wish someone would treat me like a dog. I look at my three dogs and think they have got to have the best life of anyone I know. They get their hair done every 6 weeks. They don’t have to shower every day but get bathed when they need it. They don’t have to brush their own hair; someone else does that for them. They get their ears scratched and their backs rubbed more in one day then I do in a year. They get to run naked outside. They get taken to their doctors at regular intervals and don’t have to worry about the bill. What more could anyone want? Please, treat me like a dog! One more thing. Have you ever heard of a dog who had to clean up human poop? I don’t think I have; but I have heard of many people cleaning up dog poop. Categories: Random Thoughts and Feelings | Tags: Animals, Dogs | Permalink. What Part of “BEWARE OF DOG” Don’t You Understand? This is a picture of my red king. He looks adorable doesn’t he? Doberman Pinschers have some very unique qualities. Dobie’s have been given the term “velcro dogs” because they do not want to be left alone. Dobie’s like to be with their owners all the time; no matter where they go. Yes, they will follow you into the bathroom and cry when you lock them out. It’s pitiful but true. 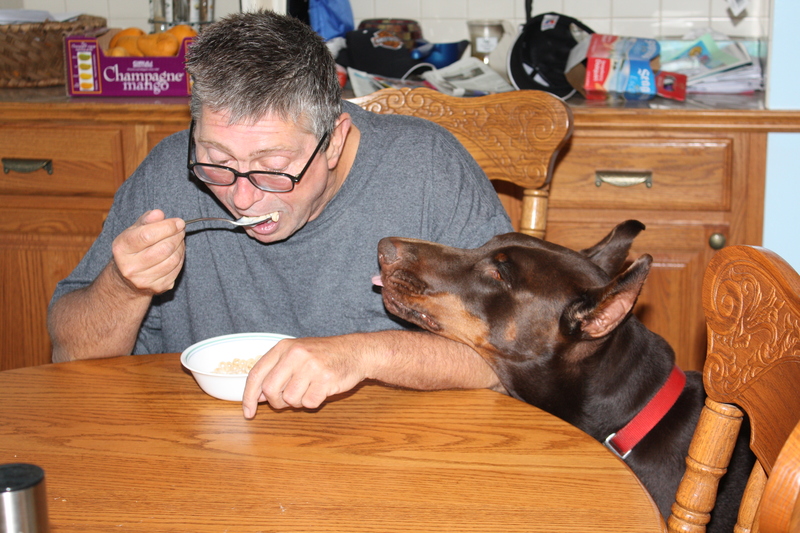 Doberman’s are fiercely loyal. The will protect their owner with all that is in them. 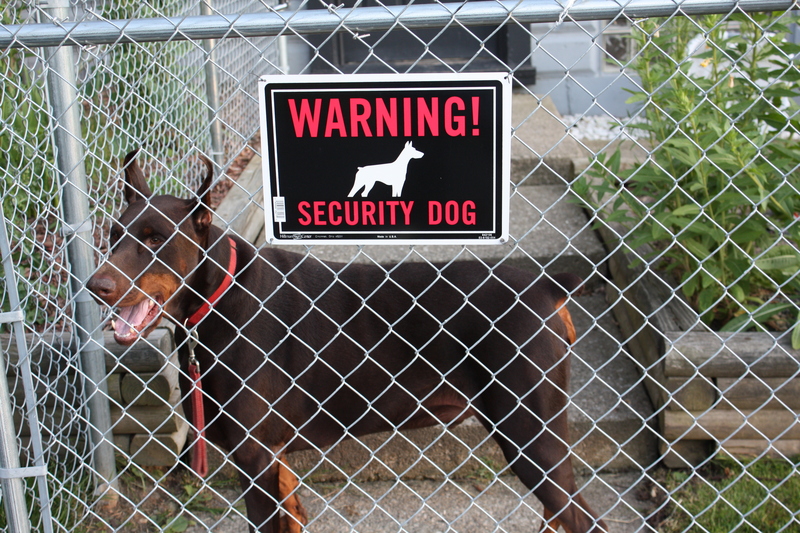 Generally, a Doberman will not give an intruder a warning. 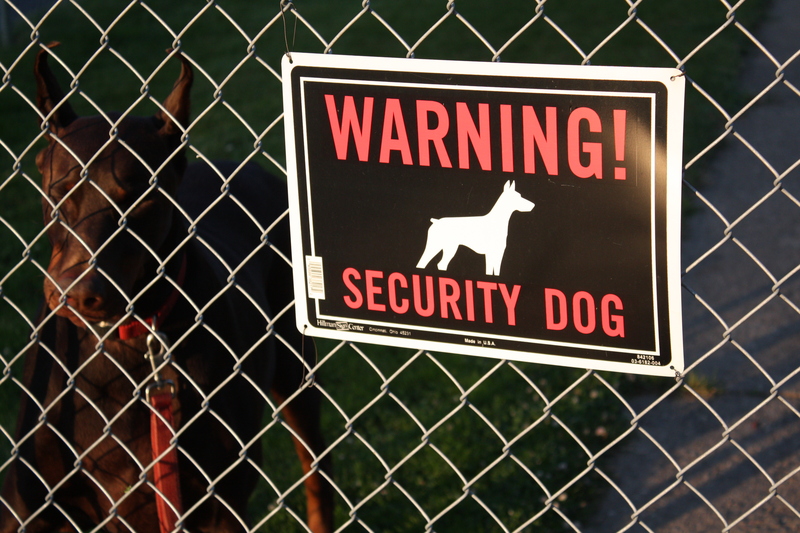 They are known for letting someone “in” but not “out.” A unique physical characteristic that Dobie’s possess is their bite. Unlike most other dogs, a doberman’s teeth scissor together. If you were to interlock your fingers, you would get a good idea of what a Doberman’s bite looks like. A Doberman biting trait is that they bite and release, bite and release; each time moving closer and closer to vital parts of your body (like your neck). All that being said; most Doberman’s are extremely gentle animals. They are loving beasts and they love attention. As big as they are, they are just as content sitting in your lap (if you let them) as they are running in a field. They are inquisitive, bright and an absolute joy. 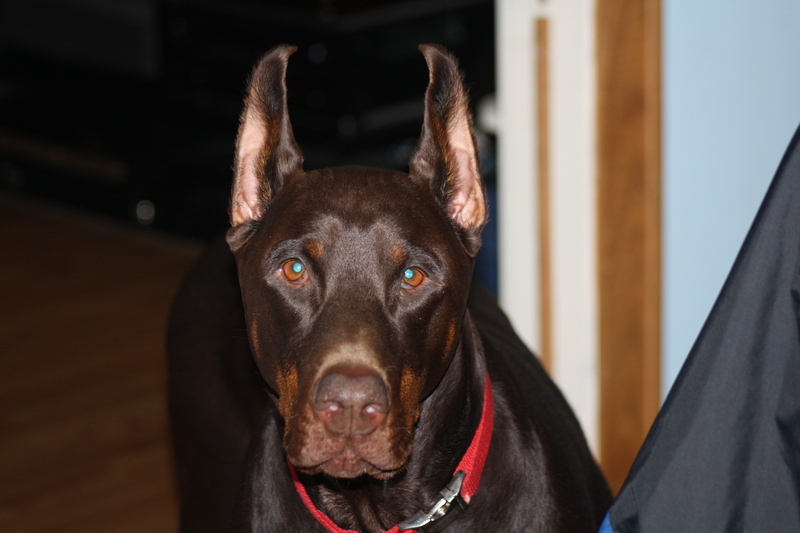 Dobie’s have a way of getting under your skin and into your heart before you know it. I know my sweet red canine friend would rather eat your hands off then have you touch me so I feel it is my responsibility to keep the public at large safe. When I walk Rory in public, which isn’t often, he wears a muzzle. When I take him to the vet’s office, I make sure it is the end of the day so that there aren’t as many animals or people in the office. I am hyper vigilant at all times when people that Rory is not used to are around. I have a dog who isn’t friendly. I know it. I love him just the same; but I do have to take responsibility for his actions. I have a fence that surrounds my entire house. My dog is able to roam freely inside the fence. There are three gates to the fence each posting a sign similar to the one above. Each entrance to my house clearly states that the dog who lives in the house is not friendly. Personally, I think the message can’t be any more clear. So, when you see a fence with a sign at each gate clearly stating that is isn’t wise to come inside……WHY DO YOU COME INSIDE? 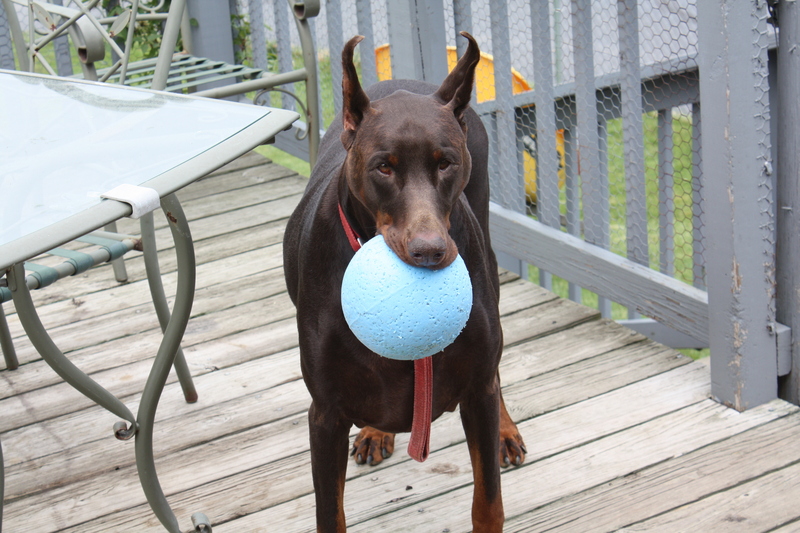 Did I mention…Dobies are really fast????? 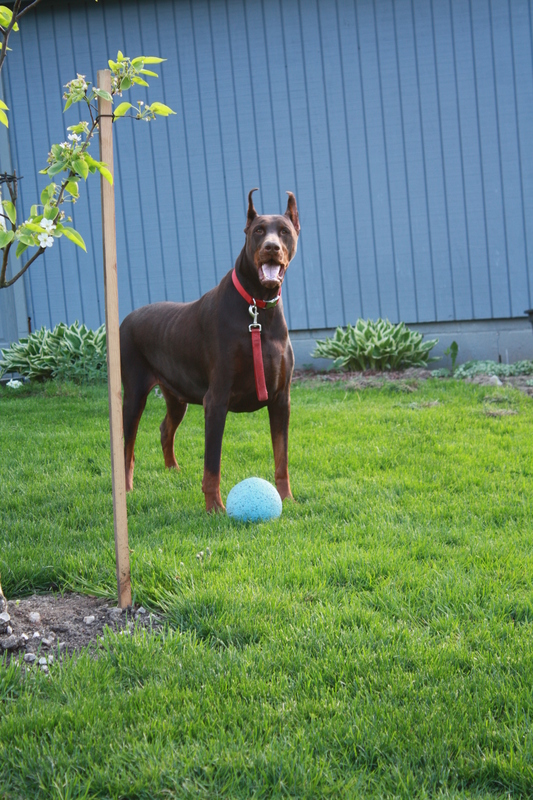 Categories: Random Thoughts and Feelings | Tags: Animal Safety, Doberman Pinschers, Dogs | Permalink.